Tag line: "Drink From Me And Live Forever"
What makes Neil Jordan’s Interview with the Vampire so unique is its point of view. Throughout the history of the cinema, the majority of vampire films (at least those that achieved any level of success) have been presented solely from mankind’s perspective. F.W. Murnau’s 1922 horror classic, Nosferatu, wasn’t so much the story of the evil Count Orlok as it was that of Hutter and his long-suffering wife, Ellen, who suddenly had to cope with the threat of living across the street from a monster. Tod Browning’s 1931 version of Dracula possessed a dual personality, mixing in equal parts the tale of Mina Seward’s fight for survival with that of Dr. Van Helsing’s quest to defeat the Dark Prince. Despite the fact that the vampires themselves were usually the title characters, their existence in these films was little more than a means by which to challenge the human condition. This is one reason I was so utterly fascinated by Interview with the Vampire, a film in which the bloodthirsty undead finally get their chance to take center stage. Louis (Brad Pitt), a 200 year old vampire, wants to tell the world his story, so he grants an interview to reporter Daniel Malloy (Christian Slater), during which he conveys the dramatic details of his plunge into darkness. The year was 1791, and Louis, a New Orleans plantation owner whose wife had just passed away, decided, in despair, to take his own life. 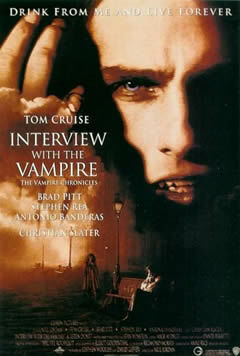 Before he has a chance to end it all, however, he meets Lestat (Tom Cruise), a vampire who grants Louis the gift of eternal life with a solitary bite on the neck. Shortly after his transformation, Louis begins to question whether such an existence is, indeed, a gift…or a curse. Plagued by the memories of his life as a mortal, Louis can’t bring himself to kill another human being, and chooses instead to feast on the blood of rats and other small animals. Lestat taunts Louis for his “misguided” morality, yet Louis never forgets what it was like to be human, leaving his ‘life’ as a vampire depressingly unfulfilled. Brad Pitt delivers an extraordinary performance as the monster who can’t escape the memory of his life before the darkness. His Louis despises the fact that he must draw the blood of innocents in order to survive, a direct contrast to Tom Cruise’s treacherous Lestat, who takes pleasure in the kill. When Louis lures a wealthy socialite (Lyla Hay Owen) out into the darkness with the intention of attacking her, he instead winds up murdering the woman’s two poodles, drinking their blood as his intended victim screams for help. While the failure to ignore his own humanity works against Louis at the outset, this very quality will eventually make him the envy of others of his kind, including Armand (Antonio Banderas), the leader of a band of vampires whom Louis encounters one year in Paris. Armand recognizes that Louis, despite his feelings of inadequacy, is, in fact, the perfect vampire; a being who has achieved immortality, yet continues to maintain a very mortal frame of mind. When it comes to cinematic monsters (in particular, any of the ‘classic’ creatures), it’s usually the sad, pathetic ones like Frankenstein’s monster who gather up most of the audience’s sympathy. Vampires, on the other hand, are symbols of the true harbingers of evil, and are thus reviled the world over. In Interview with the Vampire, we get to know these children of the night who were once, and not long ago, mortals just like us. We discover that the craving for blood does not entirely wipe away the guilt for having to spill it, and that, even among the eternally damned, there remains a glimmer of humanity, no matter how many hundreds of years may pass. I still have yet to see this picture (but own a copy of the music score, oddly enough). It sounds like a masterpiece so it ought to end up in my DVD player sooner rather than later. @Ian: Thanks for the comment! I myself saw this movie for the first time only about 4-5 years ago, and while I can't say I found it as frightening as Oprah, I was intrigued by many of the underlying themes. When you do finally see the film, please be sure to stop back and let me know what you thought of it. Although I have never read the Anne Rice novels, Interview with a Vampire is one of my favourite vampire movies, and one of the more intriguing - particularly the subplot involving Claudia the child vampire played by Kirsten Dunst. Pitt's performance is also a standout - but then again, when isn't it? @Klaus: I didn't even get into Kirsten Dunst's character, but I agree with you; her eventual attraction to bloodletting is an interesting contrast to Pitt's abhorrence of violence. One of my fav films from the 90's. Was kept close to the book..Depicted the appeal of vampirism..in its classic form..eternal life, romance,the quest for others.. It sends a lovely frightening essence to someone who may be new to the genre. A definite must-have for any Vampire lover's home library! Thanks for stoping by, and I couldn't agree with you more regarding this film. Your description is perfect, and yes, it is a must-have! Dunst was powerful, both in this and in Mother Night, where she has one incredible scene. Pitt is very good, and I thought Cruise was good as well (especially at the end). @Anthony: Thanks for the comment. Dunst was very good, as was Pitt. I thank you for pointing out the DARK SHADOWS connection. I'm not familiar with the show, but have heard of it. And yes, I'm on-board for the Burton/Depp film version as well. It sounds intriguing. I really don't get why so many people say they dislike this film, for I truly like it so much, due to precisely what you said about it being from the vampire's perspective, showing perhaps a bit of their human side through Louis' guilt. And what everyone said above about Dunst performance and character, I share the same opinion on that too. And I must add Tom Cruise, because I thought it was so weird to see the typical american hero as a vampire, and even though you could see Cruise on Lestat's gestures, I thought it actually worked! Also I have to say that I really enjoy the way you write, it's very engaging. @Maria Sofia: Thanks so much for stopping by, and for the comment. I certainly agree with everything you said, and I admire this film for many of the same reasons as you. I also thank you for the compliment. It really is nice to hear, and I'm glad you're enjoying the blog. Everyone in this film delivered very powerful and very emotional performances that were spot on with everything the book made you feel. It's an extremely awesome thing when a movie can reproduce almost exactly the sensations you get from an incredibly detailed and well-crafted book. Interview with a Vampire is one of my favorites. It's interesting though that the sequel, 'Queen of the Damned' was such a disaster. Even Anne Rice said she was disappointed by it. @Maya: Thanks for stopping by, and leaving a comment! I agree: the performances were exceptional for the most part. I haven't read the book, but I've heard the same from many people. And I, too, was NOT a fan of QUEEN OF THE DAMNED! A definite let-down after this movie.